Queensland is the 'Sunshine State of Australia'. Sunny and bright throughout the year, it encourages outdoor adventures, such as beach sports, scuba diving, and exploration of National Parks. 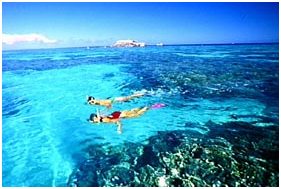 And Queensland is where one finds the Great Barrier Reef - the world's largest coral reef. The majestic coral structures that make up the Great Barrier Reef stretch over 2,500 kilometres and the world's most unusual plants and animals are found here. The rainforests of the Wet Tropics near here, have remained untouched for millions of years and are rarely found elsewhere. A masterpiece of nature, it is a delight for scientists and nature lovers. Floating in a hot-air balloon, rafting a foaming river, skydiving, or racing across the outback into the setting sun on a wilderness, trail bike safari etc. are a few other things that one can engage in. Far North Queensland is a wonderful tropical paradise. Cairns is the main entry point and from there you can travel north or south and out to beautiful island resorts. Luxury holiday homes are a great accommodation option in this part of Australia.